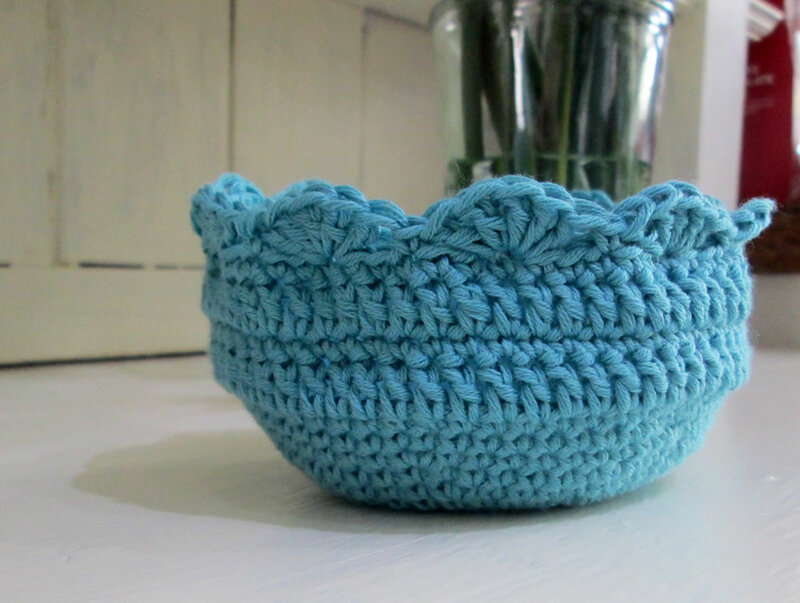 A Crocheted Bowl Pattern is the 4th in a series of posts I’ve been writing about storage ideas that you can make quickly and easily! If you haven’t seen the previous posts in this series, you might like to check them out. 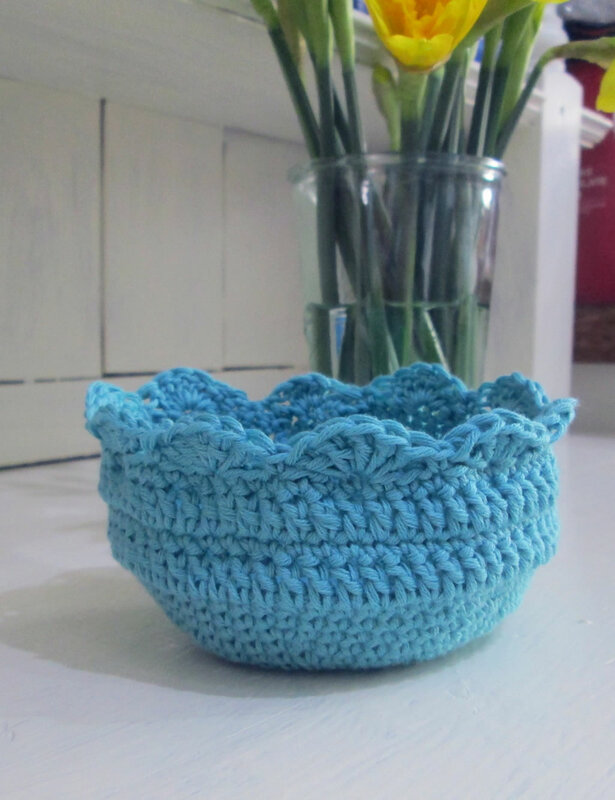 This little crocheted bowl is worked in a circle using double and treble crochet. 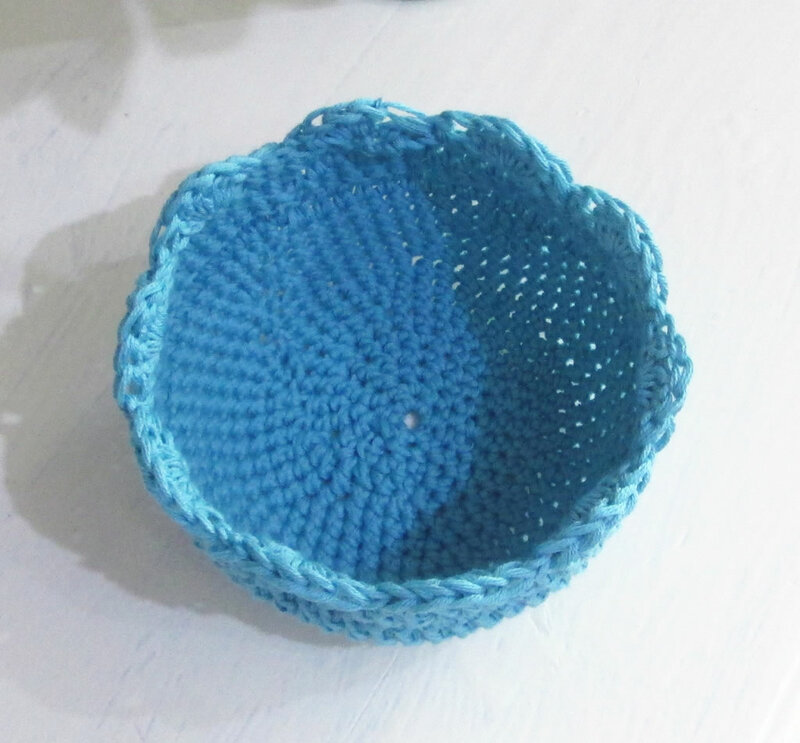 The edge of the bowl is finished with picot edging. 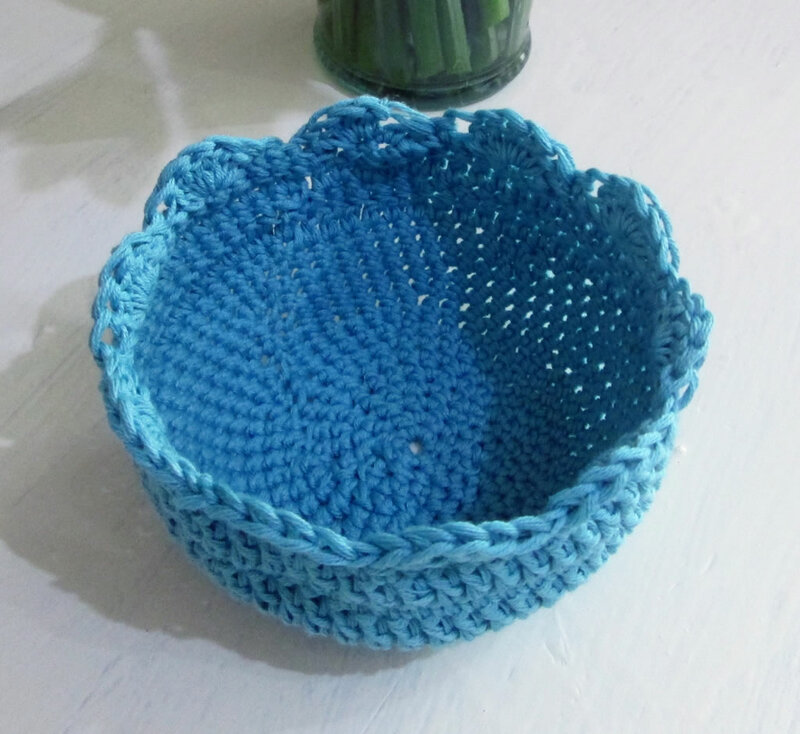 To make a larger bowl, you could either use heavier weight yarn and a larger hook, or when making the base of the bowl, you can continue increasing for more rounds instead of just 8, then continue with the pattern. Please be aware that being English I have used British crocheting terms! At the end of each round, join the last stitch to the first with a slip stitch. Make 4 ch, join with ss OR make a magic ring. 1. 6 dc into the ring. Join with ss. 2. 1 ch, then *2 dc into next st* 6 times. 12 stitches. 3. 1 ch, then *1 dc into next st, 2 dc into next st* 6 times. 18 stitches. 4. 1 ch, then *1 dc into next st, 1 dc into next st, 2 dc into next st* 6 times. 24 stitches. 5. 1 ch, then *1 dc into each of next 3 st, 2 dc into next st* 6 times. 30 stitches. 6. 1 ch, then *1 dc into each of next 4 st, 2 dc into next st* 6 times. 36 stitches. 7. 1 ch, then *1 dc into each of next 5 st, 2 dc into next st* 6 times. Join with ss. 42 stitches. 8. 1 ch, then *1 dc into each of next 6 st, 2 dc into next st* 6 times. 46 stitches. 9. 1 ch, then 1 dc into each stitch. 10. 1 ch, then 1 ch, then *1 dc into each of next 7 st, 2 dc into next st* 6 times. 54 stitches. 11. 1 ch, then 1 dc into each stitch. 12. 1 ch, then 1 ch, then *1 dc into each of next 8 st, 2 dc into next st* 6 times. 60 stitches. 13. 1 ch, then 1 dc into each stitch. 15. 2 ch, then 1 tr into each stitch. 16. 1 ch, then 1 dc into each stitch. 19. This row makes the shell edging. 2 ch, then 4 tr into 3rd st from hook, *1 dc into 3rd stitch along, 5 tr into next 3rd stitch along* until the edging has been made all the way round. 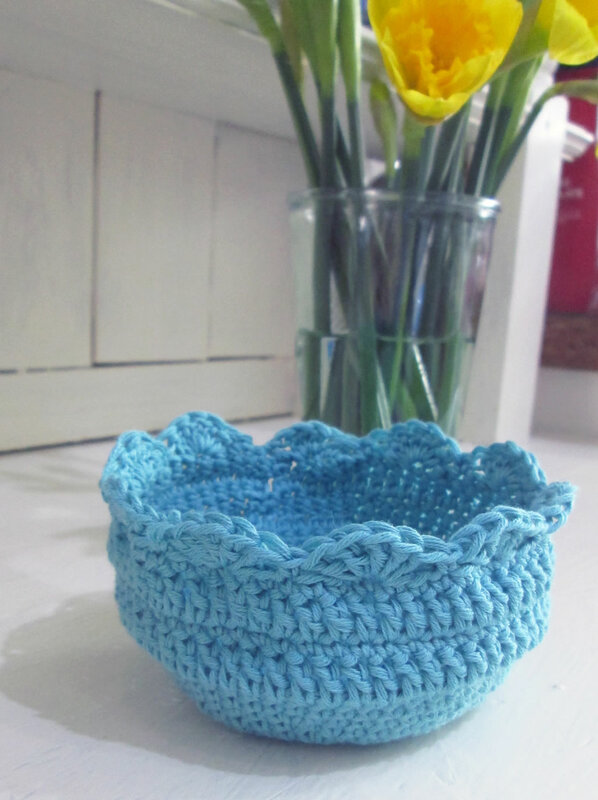 I’m going to be using my little crocheted bowl for all the bits of Lego that find their way into the washing machine! I used this yarn from Hobbycraft and a 3.5 mm crochet hook from this set from Amazon . These are affiliate links. 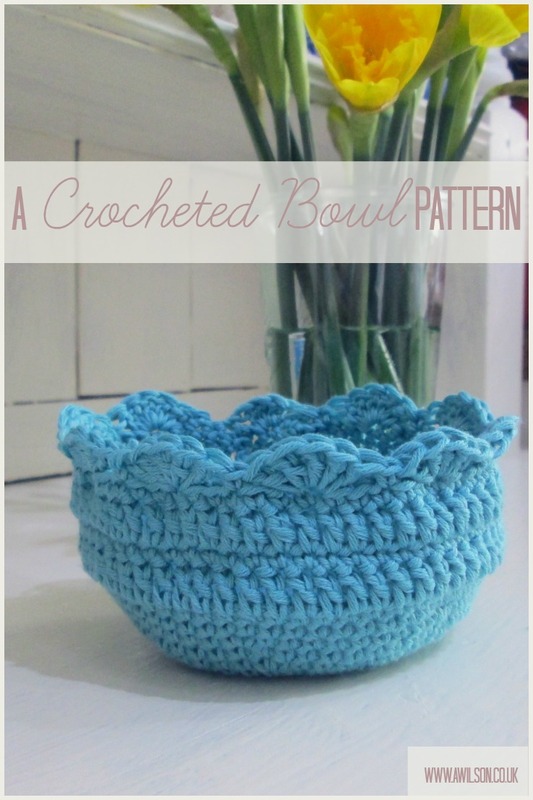 Love, love, love the crocheted bowl! such a sweet bowl! love the blue too! Usually people leave them plain, I love the scallop edging, makes this bowl so unique! I thought the pretty edging would finish it off nicely! You’re welcome. If you make one, I’d love to see it!